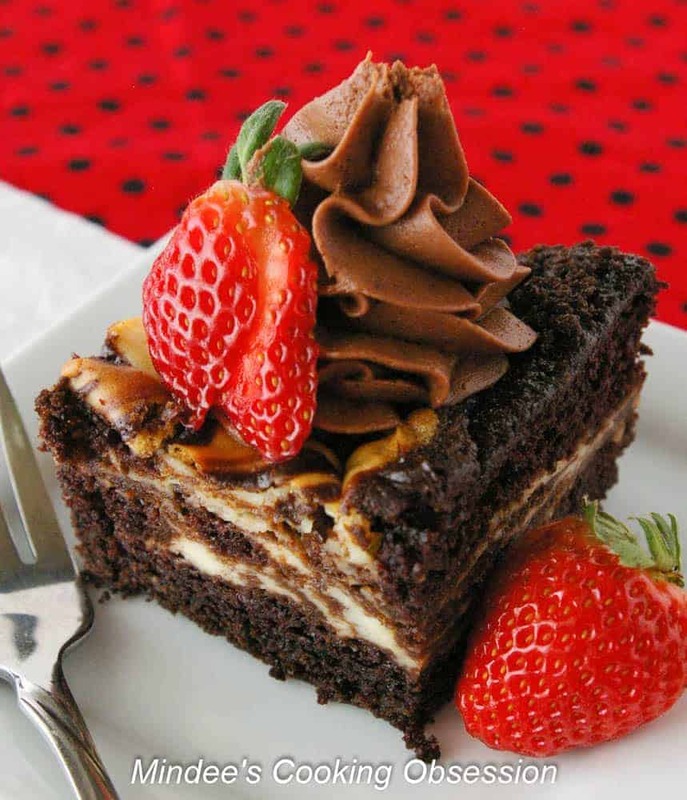 Cheesecake swirled chocolate cake is as easy as it is delicious. You’ll love this dense, moist cake with swirls of cheesecake throughout! Valentine’s day is coming right up! Most of us like to make something sweet for our sweetie, right! This is a fairly simple recipe that turns out beautifully! 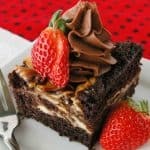 Cheesecake swirled chocolate cake is a dense, moist chocolate cake with cheesecake ribboned throughout and topped with chocolate cream cheese frosting. So if you are looking for something simple, but still fancy give this a try! I know you’ll love it! Preheat your oven to 350 degrees and spray a 9×13 baking dish well with non-stick baking cooking spray. Prepare the cake batter and the cheesecake batter. Pour half the cake batter in the prepared pan. 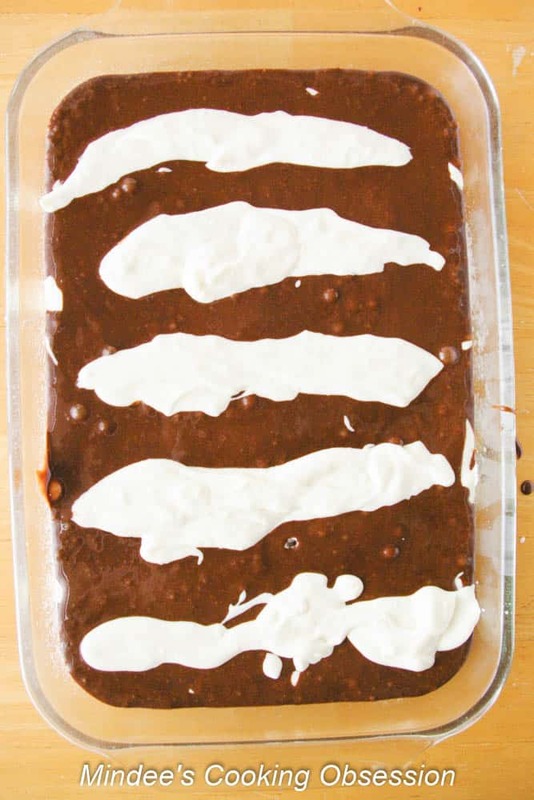 Pour half the cheesecake batter in thick stripes across the cake batter. Top with the remaining cake batter. Stripe with the remaining cheesecake batter. Run a knife through the batters in a figure eight motion back and forth starting on one end of the pan and moving to the other. After moving for one side to the other don’t go back through. 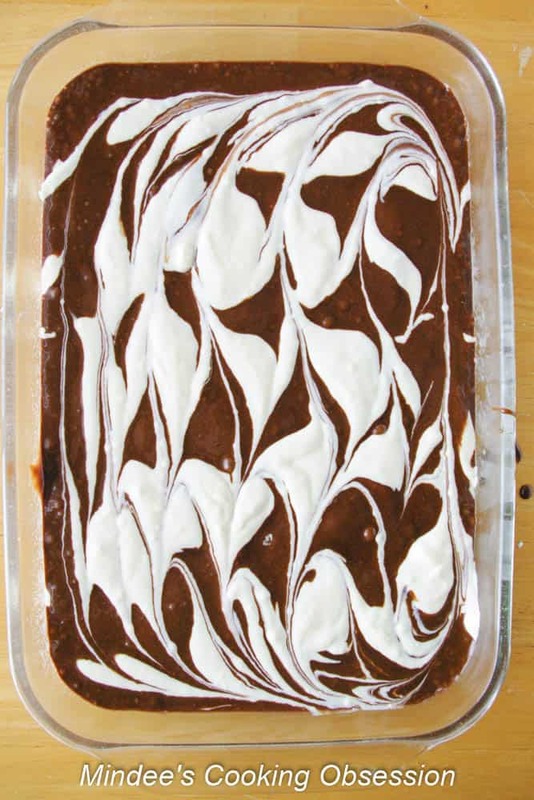 Over swirling blends the cheesecake batter into the chocolate cake batter too much and you’ll lose the marbled effect. Bake at 350 for 45 to 50 minutes. A toothpick should come out with moist crumbs. Cool to room temp and then refrigerate for 4 hours. This cake tastes better cold. Prepare the frosting. Either spread across the top of the cake or pipe frosting onto each individual piece. I used a Wilton 1M tip. Enjoy! Total Time doesn’t include 4 hours of chilling. Preheat the oven to 350 degrees and spray a 9×13 baking dish with non-stick baking cooking spray. Whisk together the sugar, flour, cocoa, baking powder, baking soda and salt. Whisk together the sour cream and milk. Beat into the dry ingredients with the eggs, vegetable oil, and vanilla. Beat at a medium speed for 1 minute. Carefully beat in the boiling water and beat until blended and smooth. Set aside and prepare the cheesecake batter. Beat cream cheese and sugar until fluffy. Beat in the milk, egg and vanilla until smooth. Pour 1/2 the cake batter into the prepared baking dish. Pour the remaining cake batter over the top of the cheesecake stripes. Pour the remaining cheesecake batter in thick stripes across the top of the cake batter. Using a knife, moving from one end of the dish to the other in figure eight motions swirl the cheesecake batter and the cake batter. Start on one side of the pan and end at the other. Do not continue to swirl after this or the cheesecake with just blend in with the cake and you will not get the swirled, marble effect. Bake at 350 degrees for 45-50 minutes. A toothpick should come out with moist crumbs. Cool completely and then refrigerate for 4 hours before cutting and serving. Beat the cream cheese and butter until blended and smooth. Beat in the cocoa powder until smooth. Beat in 2 1/2 cups of the powdered sugar. If you want a stiff frosting add another 1/2 cup of powdered sugar. Either spread across the top of the cake or pipe onto individual pieces. I used a Wilton 1M tip. The chocolate cake was inspired by Hershey’s Perfectly Chocolate Cake.